Our business cards are printed to a 350gsm heavyweight silk board and laminated either gloss or matt to one or both sides. 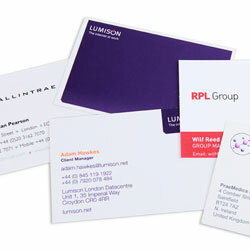 They can be printed full-colour front only or with a black-and-white or full-col reverse. The standard size is 85x55mm for cards, other sizes and paper types are available on request.